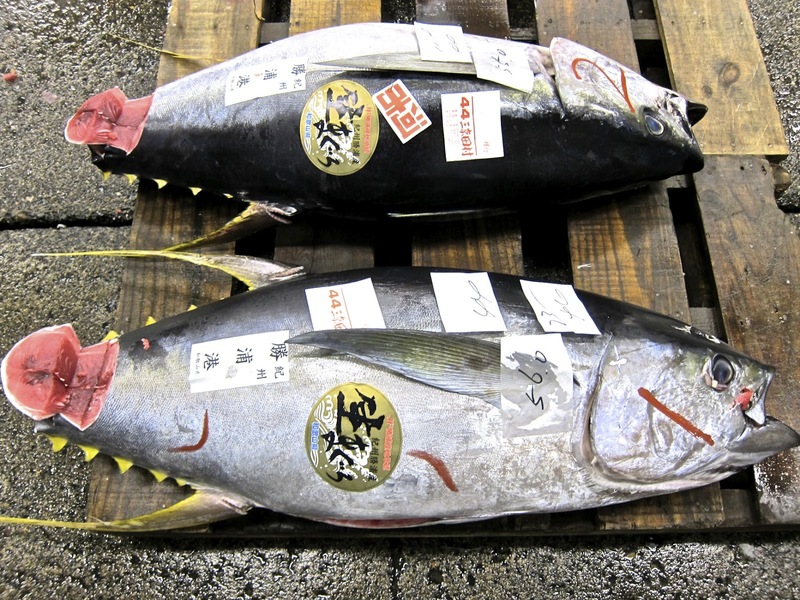 The most exclusive, expensive restaurants and sushi bars buy up the highest quality tuna. Before he became a tour guide, Toby was a sushi chef so he knows his tuna. He bends over a beautiful fish and points to the part of the tuna most prized by aficionados-the belly. The look in his eyes says, where's my sushi knife, let me at it! We watch the action until the last tuna is sold. A large fish flown in from Spain sells for $5,000.00. Toby tells me, before the financial bubble burst, the same fish would have cost two or three times as much. 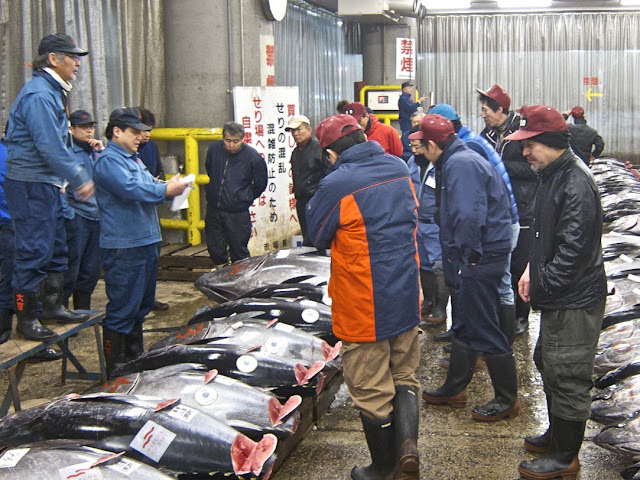 One fish even sold for $45,000.00. Coming outside the cavernous market warehouse, snow flurries have started. I need food to fight off the cold. 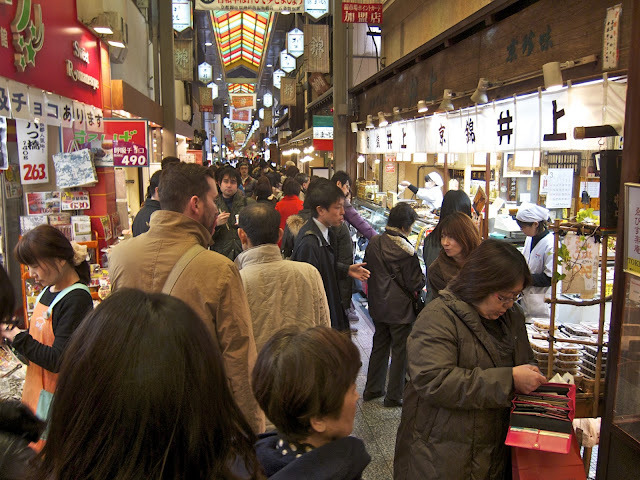 In Tokyo, at the popular Tsukiji fish market, encircling the market are dozens of soba, udon, ramen noodle shops and sushi bars. Even early in the morning, the narrow sidewalks are full of locals and tourists in search of tasty treats. Toby leads me down one narrow street after another because nothing is open and the restaurant he knows isn’t easy to find. I am really cold, regretting not bringing my gloves. Finally he locates Kiyomy a block from the Shichijo Street entrance of the Wholesale Market. We enter a poorly lit stairwell leading down several flights. No bigger than a small living room, the windowless, basement restaurant has old wood and glass fronted cabinets lining the back wall behind a counter with half a dozen stools. We take a seat at a red plastic booth that would have been at home in a Route 66 diner. 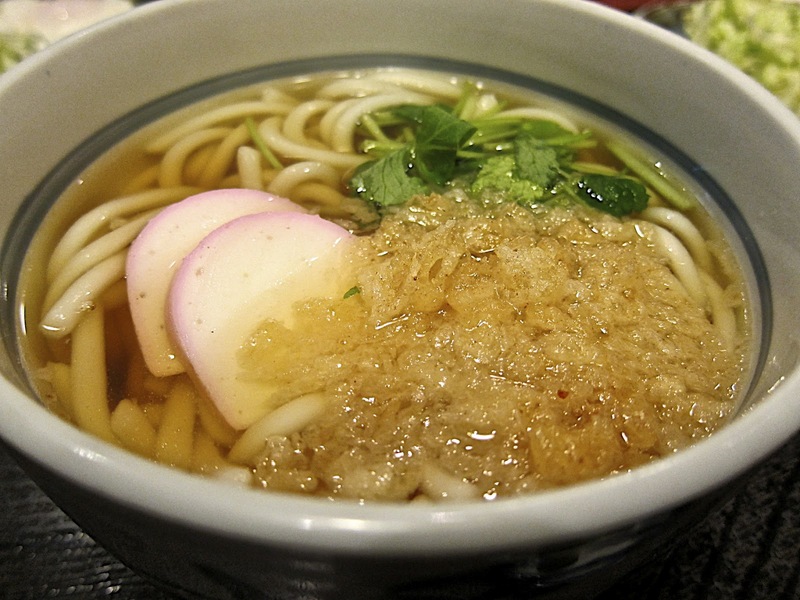 I order a “set” of hot soup with fat udon noodles, a rice bowl topped with scrambled eggs, sautéed onions, spinach and slivers of dried nori (seaweed), a mug of dark hot tea and green cucumber pickles in the Kyoto style—tart, crispy and salty. The soup is steaming hot, the noodles warm and chewy. Scrambled eggs on rice is new to me and it's good. Breakfast warms me up, now I'm ready to go back outside and explore Kyoto. Kyoto is a beautiful city. Come during cherry blossom season at the end of March or in the fall when the leaves turn and Kyoto fills with color and excitement as tourists and locals stay outdoors enjoying every moment of this transitory, natural beauty. A love of nature is deeply ingrained in the Japanese spirit. 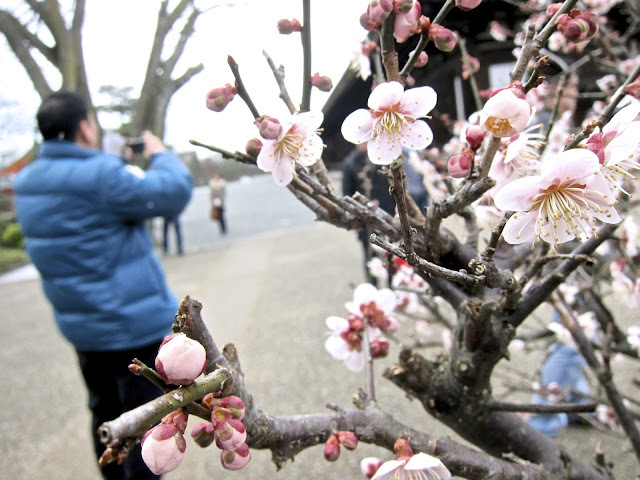 Visit, as I did, a temple like the Sanjusangen-do Temple, and you'll see dozens of Japanese surround and photograph a plum tree in bloom. Come any time of the year to visit one of Kyoto's 2,400 mostly Buddhist and Shinto temples and enjoy a celebration of harmony in the contemplation of nature. 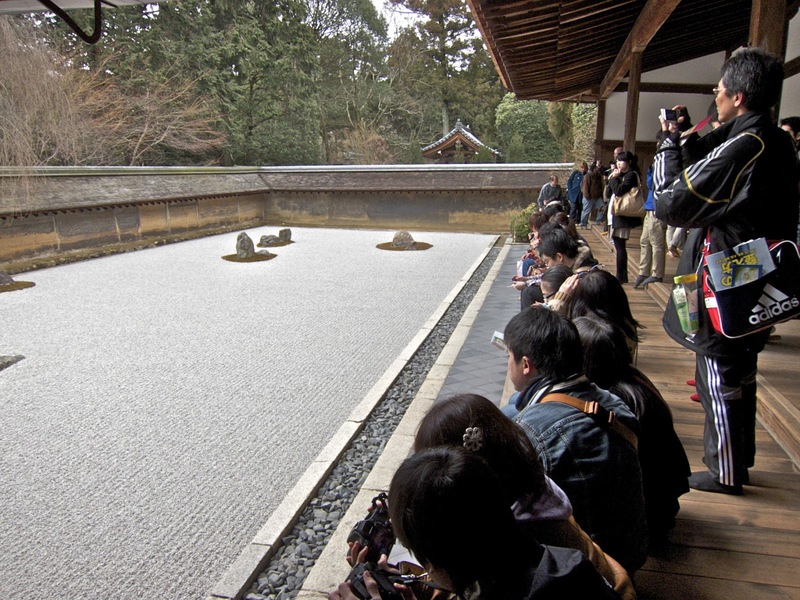 Our guide, Mie Tamada takes us to Ryoanji Temple to see the famous Zen rock garden. Everyone comes here. Grade school children, couples on a date, teenagers, college students and older couples crowd the viewing deck for their moment to look at the carefully raked stone surface. Temples aren't only for quiet meditation. At night we make our way through the busy courtyard of the Yasaka Shrine where booths with fast food snacks are set up to celebrate the Hanatoro festival of lights. Tamada shows me the octopus balls, a favorite at the festival, asking if I want to try them. 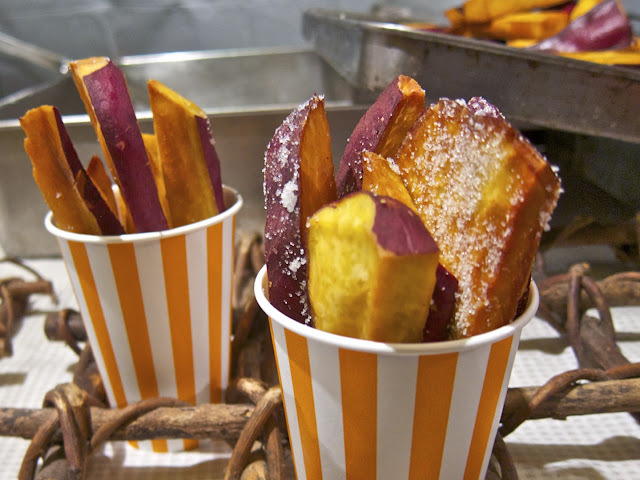 They look good, but I'm more interested in the fried slabs of sweet potato, sprinkled with sugar. Our formal introduction to the food of Kyoto is an hours-long eight-course vegan lunch at the Shunko-on Zen Temple, a Zen Buddhist temple in the Myoshinji Temple complex. Catered by Ajiro, the vegan restaurant at the entrance to the Temple, our host, Rev. 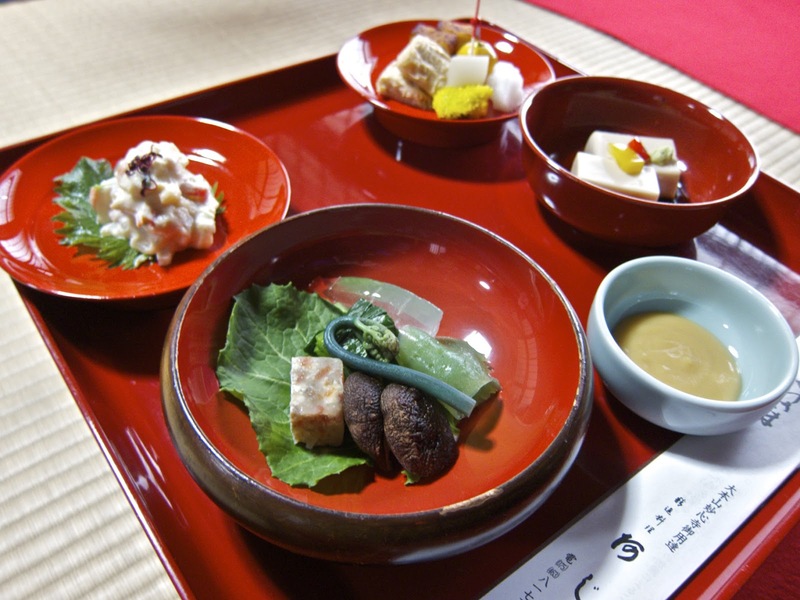 Takafumi Kawakami, explains that Zen dishes are intended to cultivate the body and the soul. Each dish is visually composed to create contrasts of color and texture. We're hungry and happily eat the pretty looking dishes. To experience Kyoto's cosmopolitan qualities, we go to an upscale department store where customer service is as important as the high quality goods. The vibe is very 1960s. Don Draper would feel very much at home. Attentive, smiling clerks greet us in the Daimaru Department Store as we enter each department, offering to find us exactly what we need. If you visit Daimaru, you have to go downstairs to the elegant food court where prepared foods take center stage in jewelry style display cases. Since very few people in Kyoto speak English, without a guide we would have a difficult time asking for what we want, but in the food court it's easy to point and gesture to sample the tasty treats displayed in the glass counters--cakes, donuts, muffins, candies, cream filled pastries, elaborate French style confections, chocolate, tempura vegetables, fried fish, grilled unagi (eel) and dozens of colorful vegetable pickles. I try an onigri (rice ball) with cooked salmon. The nori (seaweed) on the outside is toasted crisp and crunches in my mouth like a thin sheet of pork crackling. The rice is moist and sweet. The onigri tastes fresher and more delicious than ones I've eaten at home. It's tempting to taste everything. To do that, you'll need to carry cash and a lot of it. Credit cards aren't accepted everywhere and, unhappily, the dollar/yen exchange rate favors the yen, which means a cup of brewed coffee costs $5.00 U.S.
That night, guiding us through the Gion entertainment district, Tamada gestures at rows of darkened houses, explaining that these are where geisha--in Kyoto called geiko--entertain guests. Great, let's go inside. Her look says, you're kidding, right? 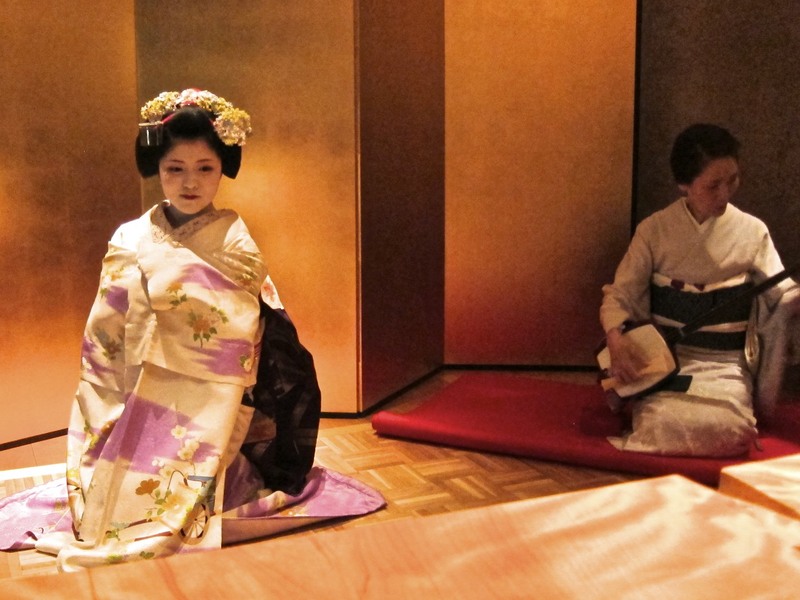 To be entertained by a geiko, she tells us, is a great honor and requires an introduction and it is very expensive. How expensive? Her answer suggests that if you have to ask, you can't afford it. Maybe we can't see a geiko but dinner is a treat. We eat at elegant Misoguigawa, an upscale French-Japanese restaurant offering a Kaiseki (multi-course) meal featuring locally sourced, seasonal meats, seafood and produce transformed into edible art. The Zen monastery lunch, the Daimaru food court and dinner at Misoguigawa are as different as meals could be and yet they are all very Japanese. They share an attention to detail, a respect for local ingredients, a sensitivity to flavor and texture and, above all, each dish has exquisite visual presentation. 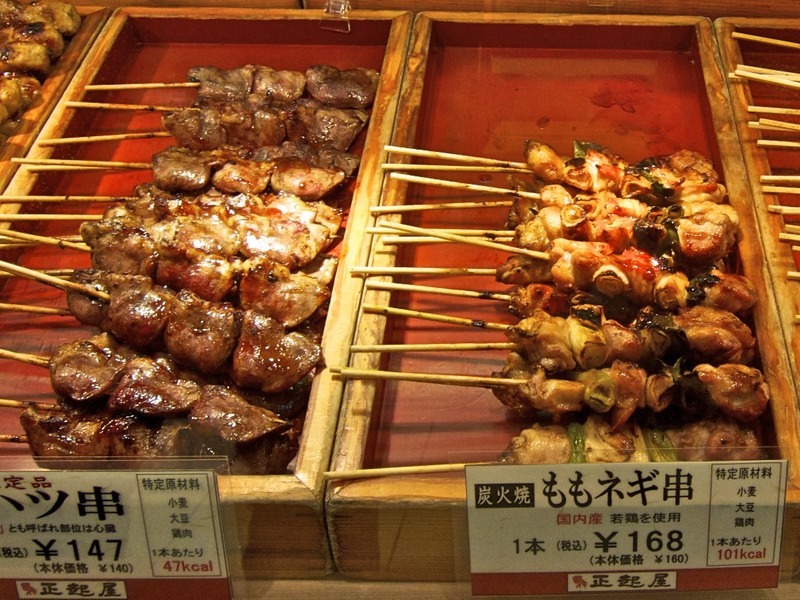 Many restaurants in Japan specialize in one preparation, technique or an ingredient--think sushi bars, restaurants serving yakitori (skewered meats and vegetables cooked on charcoal grills), tempura, sukiyaki, curry, cutlets, blowfish and noodle joints, selling ramen, udon and soba. A friend who grew up in Tokyo and Kyoto tells me that when she goes home, the first place her parents take her is to an eel restaurant because no eel in Los Angeles comes close to being that good. 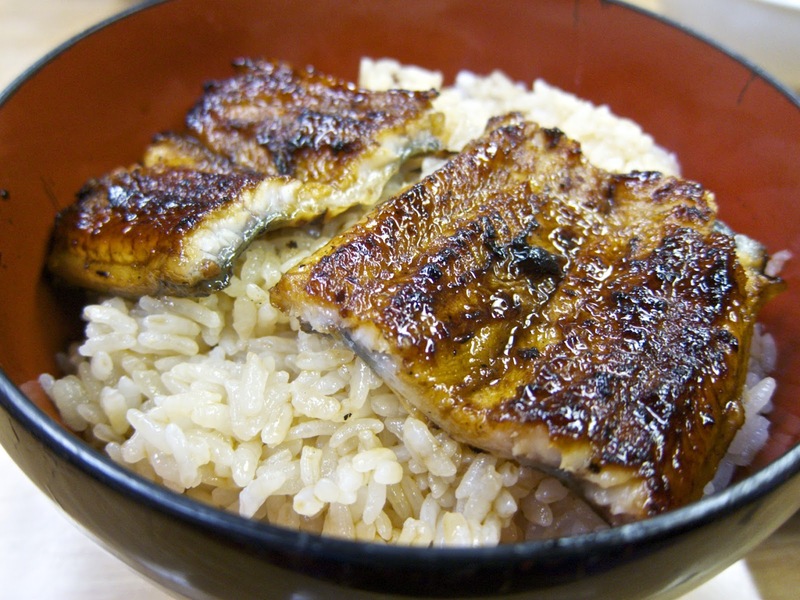 I head to Kaneyo on Sanjo Street, a restaurant specializing in Kanto style cooking where the deboned eel is grilled first without seasoning, steamed and grilled a second time with sauce. Open for more than a hundred years, Kaneyo looks like an antique country inn with smoke stained, dark wood paneling and handmade tables. Attention to detail and coaxing the best out of ingredients are hallmarks of Japanese cooking. Americans take pride in eating naturally and locally, something the Japanese have pursued for generations. Kyoto doesn't have Tokyo's bright lights and big city vibe. But there's still a party going on in Kyoto. 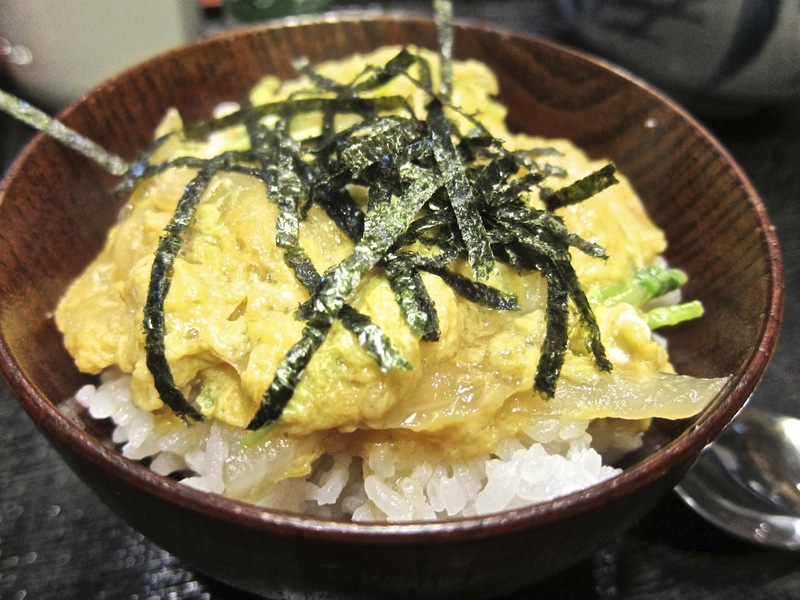 If you're looking for a place to hang out with friends, try an izakaya, a drinking bar with small plates of food. Izakaya are showing up in U.S. cities. In Kyoto experience the real deal. 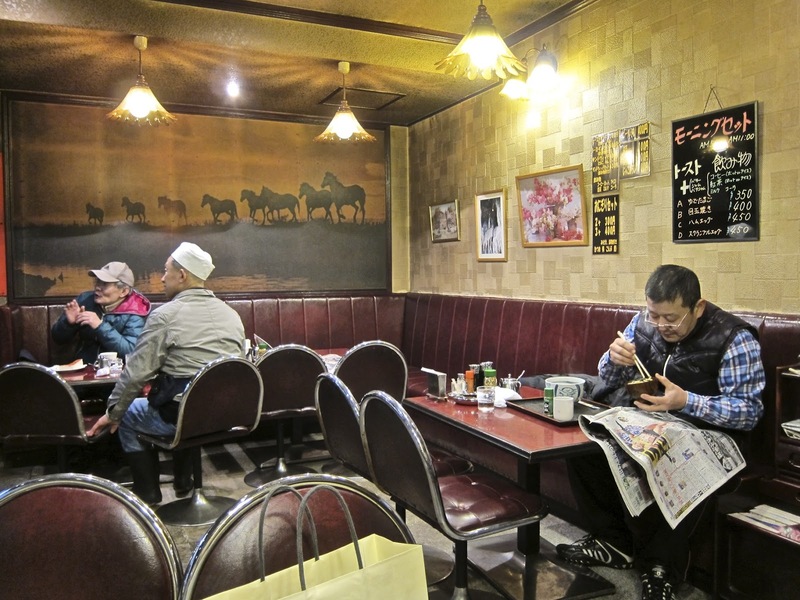 Usually small restaurants, each with a specialty, an izakaya is whatever the owner-chef wants it to be--dark and intimate, crowded and smoky or casual and laid-back. According to Ken Yokoyama, the general manager of the Hyatt Regency Kyoto, who is giving us a tour of the Gion entertainment district, a night out with friends consists of dinner at 5:30 pm—people in Kyoto eat dinner early—after that they go to another place for drinks, then have a bowl of ramen or udon, and finally they go to a karaoke bar for a final round of drinks. The night we walk around the Gion District, “another place for drinks” is izakaya Ichi (373-1 Kamiya-cho Takasegawauji Shijo Agaru Nakagyou-ku). A small, smoky restaurant, the tachinomi bar (a standing bar without stools) is on the left where Asada, the chef-owner, serves up drinks and small plates of curry, tempura, sushi and other snacks. Crammed together in the back are half a dozen small tables. 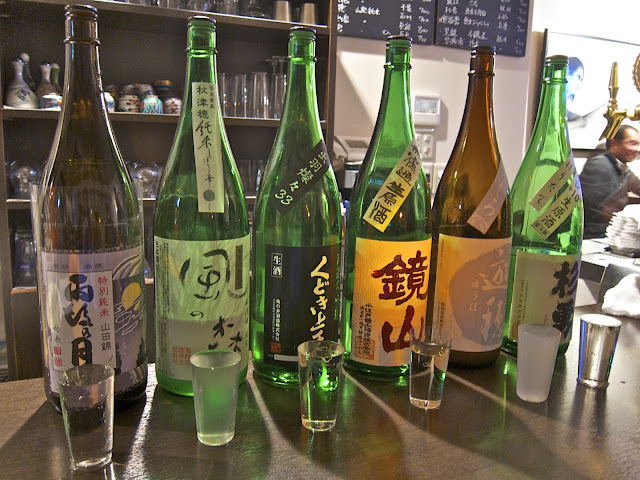 Yokoyama tells his friend we want to have a sake tasting and Asada grabs six isshou sized (1.8 liters) bottles of his favorites and sets us up at the bar. Served cold in small glasses, the sakes--filtered, unfiltered, sweet, dry, full-bodied or delicate--are as different as they could be. They are all good. I like Kagamiyama the best with its light, dry, clean taste. Speaking of good tasting sake, the next day at izakaya Dongama on the Takase River in the center of town, chef-owner Toru Shimosaka pours glasses of his favorite sake. From Fukui Prefecture north of Kyoto on the Japan Ocean, Kokuryu is dry, with a hint of sweetness. I like it almost as much as the Kagamiyama. The most fun stop on our Kyoto foodie adventure is the Nishiki Market. Five blocks long, the market has 126 shops and restaurants. Many of the stores are hundreds of years old. Used by locals to do their daily shopping as well as a tourist favorite, the market is jammed with small shops and stalls, one on top of the other with no thought to zoning regulations. 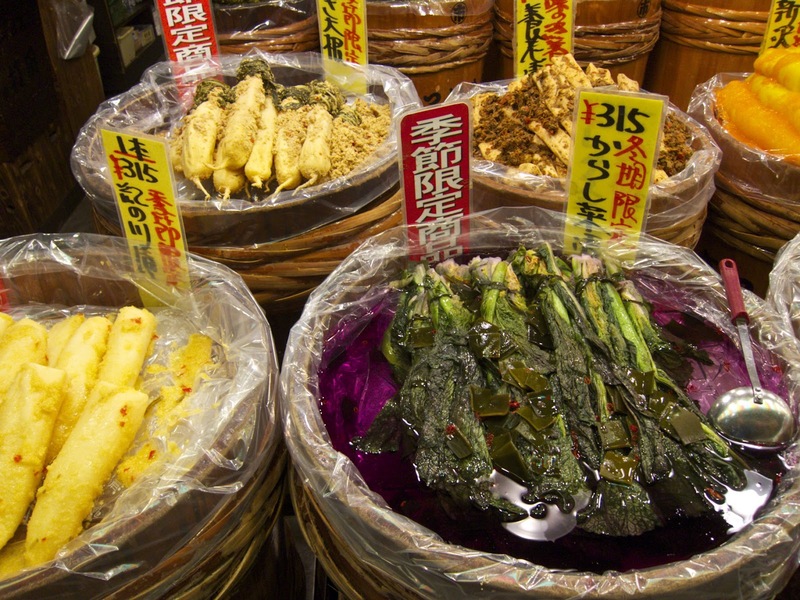 Fresh seafood shops are next to stores selling food snacks, clothing, shoes, kitchen supplies, handmade Japanese knives, coffee, tea, rice, candies, fresh produce, tourist curios and nukazuke pickles, a local delicacy. Nishiki is a shoppers paradise. We stay for hours examining the specialty items in each stall. 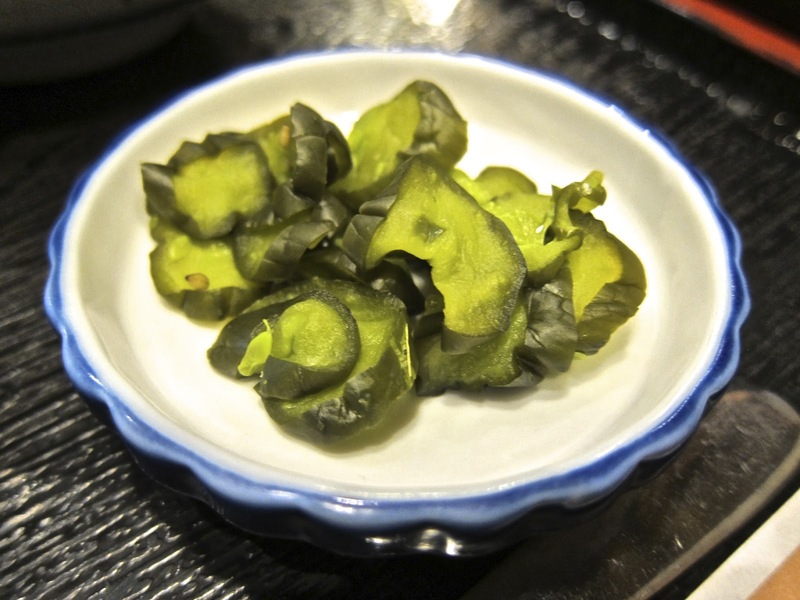 Years ago, a friend told me about her mother making nukazuke pickles at home. They aren't difficult to prepare, she says, but if I want to make them, I must have rice hulls. I'd love to try, but where will I ever find rice hulls? 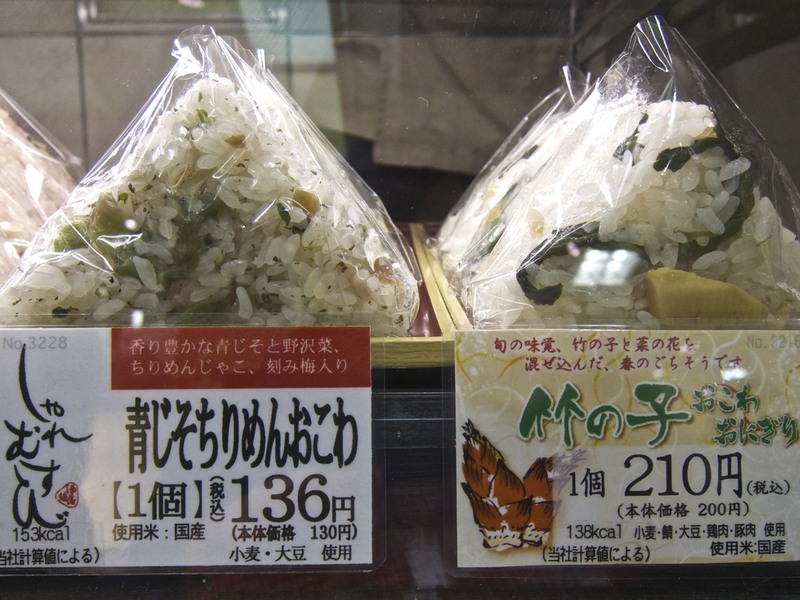 When we're visiting Chuo Beikoku (stall 107), a shop devoted to high quality rice, a large bin is filled with vacuum packed bags of rice hulls. Even though I don't have room in my suitcase for any more purchases, to the amazement of the shopkeeper, I decide I must bring back a bag of rice hulls so I can make my own nukazuke! There are so many other things I would like to buy in the market. Too bad the yen/dollar exchange rate isn’t better. 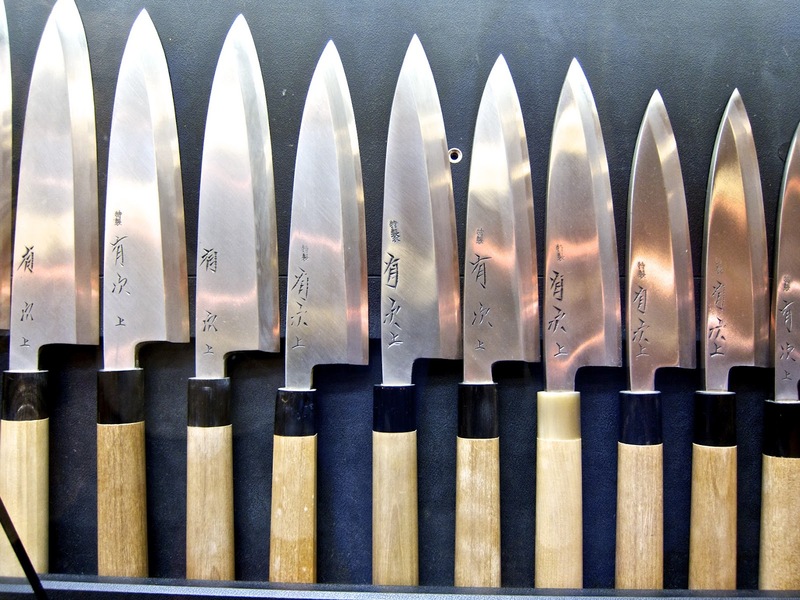 I would happily buy a hand forged Santoku knife at the Artisugu Company but they don't take credit cards and the knives are pricey. For lunch we eat at Iyomata for Kyoto style sushi. 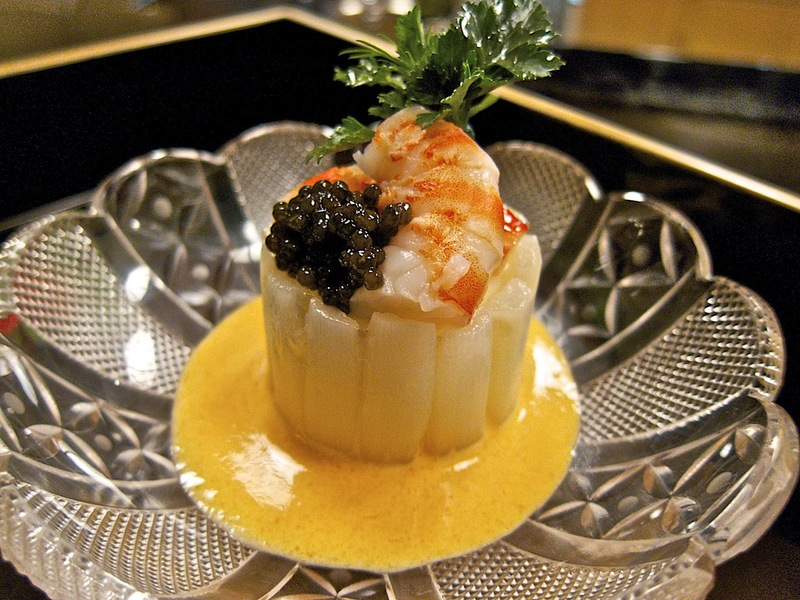 Iyomata has been serving sushi since 1696. The current owner, Matashige Toyota is the twentieth generation of his family to run the restaurant. Think about that. Twenty generations! What an amazing commitment. 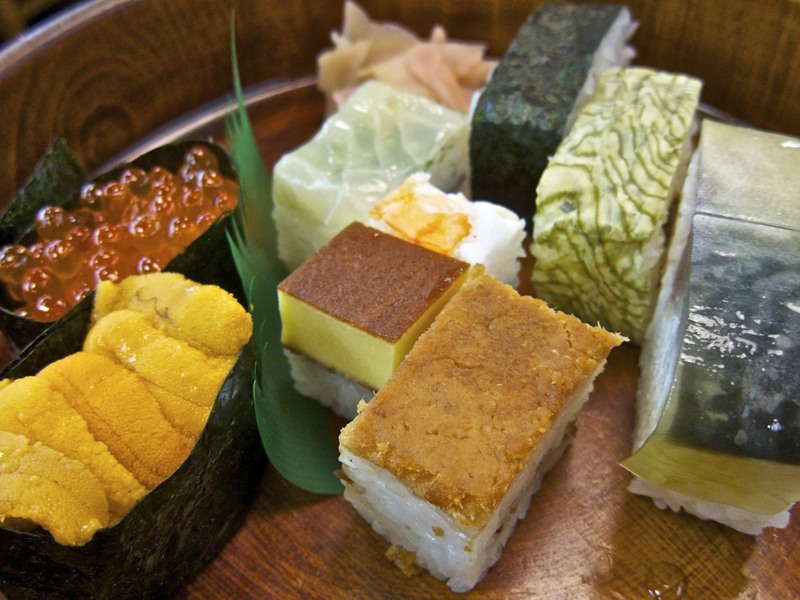 The sushi we eat in the U.S. is usually Tokyo style where the piece of fish is larger than the rice underneath. In Kyoto, the style is more formal. Lightly vinegared, the fish is molded onto the rice. 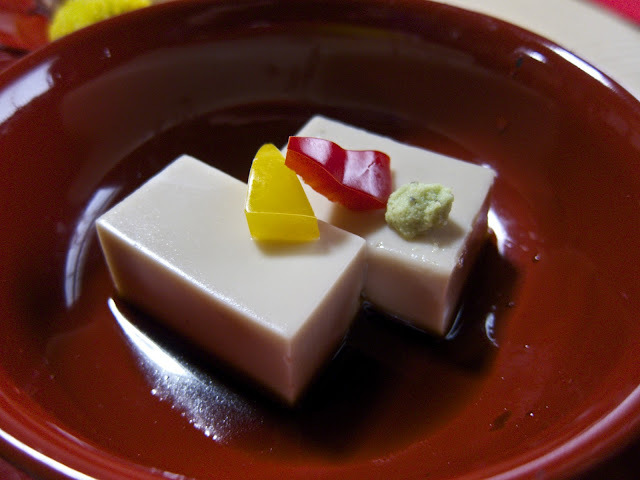 Often the fish is pressed (oshizushi style) with the result that the sushi has the precise look of a Mondrian painting. I order uni (sea urchin), salmon roe, sea bream, seaweed and pickles, tamago (egg) and shrimp, conger eel that has been pressed and looks like a mosaic and, Iyomata's specialty, mackerel sushi. Our guide instructs me to put a small dab of freshly grated wasabi on the fish, not in the soy sauce as I usually do at home. 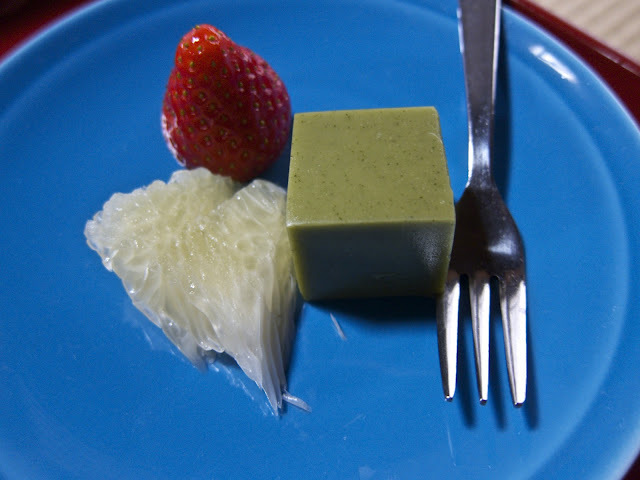 Placed directly on the fish, the wasabi's heat accentuates the vinegar's edge, adding to the pleasure of each bite. Pairing the freshest seafood with techniques learned through generations makes very excellent sushi. 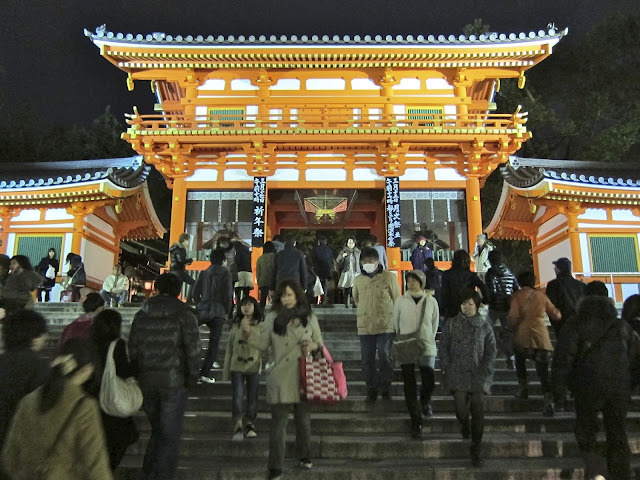 With comfortable accommodations, a variety of affordable restaurants, good bars, great natural beauty and no traffic jams, Kyoto is an exciting way to experience Japanese culture and food. Congratulations on this excellent article. Irene from Switzerland.